“Make America Great Again,” Donald Trump’s campaign slogan, was cleverly designed to suggest that the nation as a whole has been in decline. And Trump repeatedly blamed past administrations for this situation, attacking them for pursuing policies that he said left US corporations unable to compete with their foreign rivals to the detriment of US workers. US workers have indeed experienced a steady deterioration in their working and living conditions. But Trump’s focus on national decline and call for national revitalization obscures what a class analysis plainly shows: leading US corporations have greatly benefited from past policies and continue to dominate global markets and profit handsomely. In other words, US workers and US corporations do not share a common interest. Moreover, Trump administration policies designed to strengthen US corporate competitiveness can be expected to further depress worker well-being. We live in a world where economic processes and outcomes are heavily shaped by corporate globalization strategies. This means that national statistics and measures of economic performance can be misleading. Sean Starrs, in an essay titled “China’s Rise is Designed in America, Assembled in China,” makes this point by using a global lens to evaluate the relative economic strength of China and the United States. In the pre-globalization era, a country’s production tended to be nationally rooted. Thus, for example, Japan’s post World War II rise as a major producer and exporter of cars and consumer electronics meant that Japan’s “rising world share of national accounts [could be considered] synonymous [with] rising national economic power.” But transnational corporate globalization strategies have dramatically changed things. Thanks to the expansion of transnational corporate controlled cross-border production networks, the production of many goods and services has been divided into multiple segments, with each segmented located in a different country. As a result, national economic activity tends to be truncated and less revealing of national value-added than in the past. These networks are most fully developed in East Asia, and their expansion helped transform China into “the workshop of the world.” China is now the leading producer and exporter, largely to the United States, of such key products as cell phones and laptop computers. However, in sharp contrast to the Japanese experience, most of the value-added in the production of these high-technology goods is captured by non-Chinese firms. Thus, Chinese national accounts, especially its trade account, greatly overstate Chinese economic power. At the same time, US national accounts, including its trade account, greatly overstate the loss of US economic power. 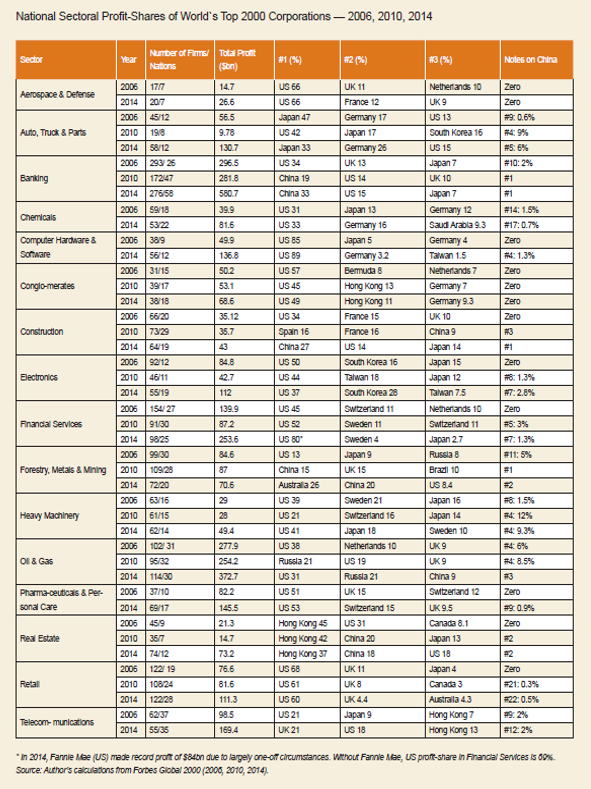 The table below, from Starrs’s article, shows China’s top five exports of manufactures, as well as export values and market share for each product. It also shows US export values and market shares for the same products. 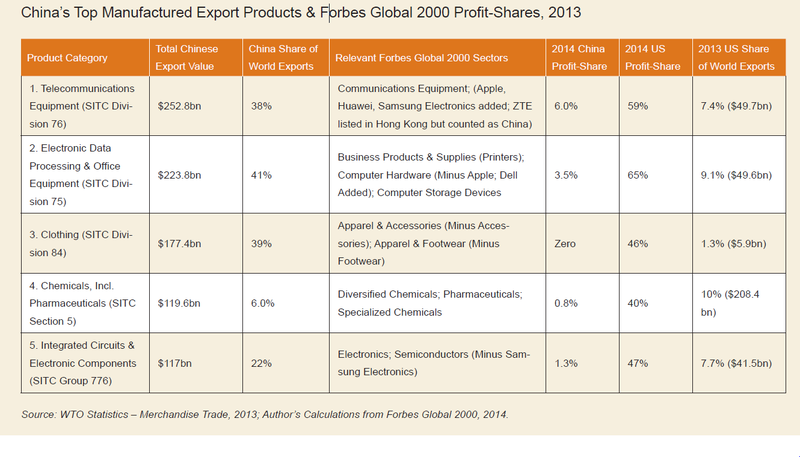 Finally, it also includes the relative share of global profits from sale of these products earned by Chinese and US corporations. Starrs used the Forbes Global 2000 list, which ranks the top 2000 corporations in the world using a composite of four indices–assets, market value, profit and sales–and groups them by their appropriate sector of activity, to calculate the profit shares. There is not a single profitable Chinese firm in textiles that is large enough to make the Forbes Global 2000, despite China’s exports making up 39 percent of the world’s. Exports of clothing from production in the United States is miniscule compared to the rest of the world, at 1.3 percent, yet American firms reap 46 percent of the profit-share — even when the top two firms in the world, Inditex (owner of Zara) and H&M, are both European (Spanish and Swedish, respectively). The reason for this is simple: Chinese production of the products listed in the table takes place within cross-border production networks largely dominated by US corporations. US firms are able to monopolize the profits generated by the production and sale of these products thanks to their control over the relevant technologies, product branding, and marketing. The point then is that in the age of globalization, national accounts are no longer a reliable indicator of national economic strength. A simple look at national accounts does paint a picture of declining US economic power. For example, the US share of global GDP has slowly but steadily declined. It was 37 percent in the mid-1960s, 33 percent in the mid-1980s, 27 percent in the mid-2000s, and most recently approximately 22 percent. The US share of world merchandise exports has also declined. It averaged approximately 12 percent throughout the 1980s and 1990s and then began rapidly falling. It was down to 8.5 percent by 2010. However, Starrs finds that once one takes globalization dynamics into account, US corporations continue to dominate international economic activity. Banking: China is first and the US second. Construction: China is first and the US tied for second. Forestry, Metals, and Mining: Australia is first and the US third. Real estate: Hong Kong is first and the US third. Telecommunications: the UK is first and the US second. Almost all of these top Chinese firms are state-owned enterprises with heavily protected domestic [markets] with very few operations abroad (with the partial exception of Chinese firms in natural resource extraction). None of these behemoth state-owned enterprises can be characterized as globally competing head-to-head with the world’s top corporations to advance the technological frontier, yet these firms constitute the bulk of the non-foreign ownership of profit from production and investment conducted in China. And the US is second to China in both sectors. In sum, it is clear that the US state has done well by leading US firms and their owners. The problem for us is that the policies that helped produce this outcome—deregulation, liberalization, privatization, and globalization, to list a few—have not benefited US workers, and in most cases workers in other countries as well. Moreover, sustained US corporate dominance does not guarantee the vitality, or even the stability of the global economy. Core economies continue to stagnate and there is no reason to think that renewal is on the horizon. In fact, quite the opposite is true; there are growing signs that the US expansion is near end and that Chinese growth will continue to weaken. Trump, with his call to “Make American Great Again,” aims to use nationalism to win support for his own efforts to advance US corporate interests. While it remains unclear to what extent his policies will differ from those of past administrations, it is already certain that they will not serve majority interests. This destructive use of nationalism must be challenged. The best way is to promote a strategy of resistance that flows from and helps to popularize a grounded class analysis of the workings of our economy. For some time, some in the media have blamed workers themselves for their low and stagnate wages. We now have a technology intensive economy, they said, and to get ahead you need a college education. 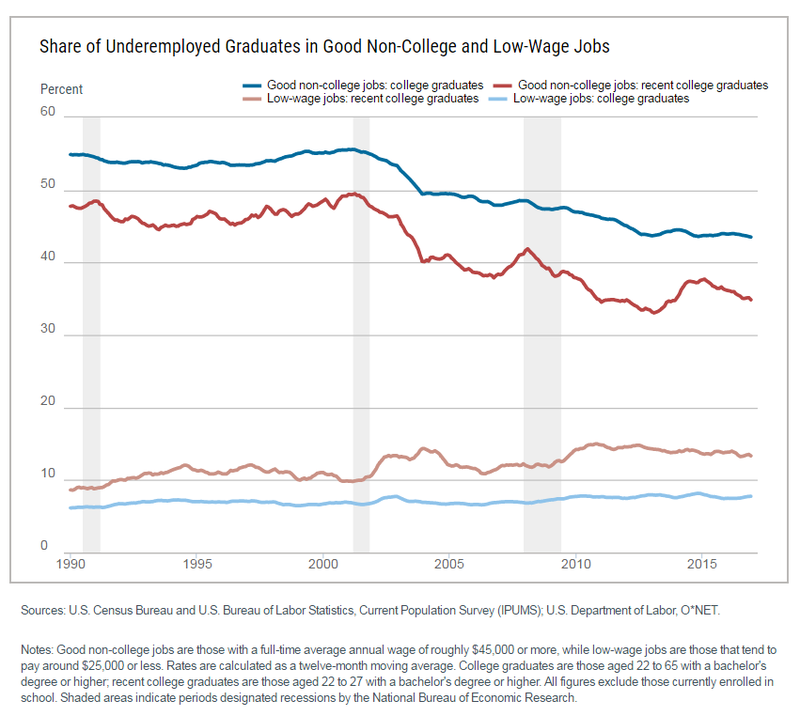 Well, the trends, as illustrated in the following two charts from the Federal Reserve Bank of New York are clear: college grads are also struggling. The chart below shows underemployment rates for college graduates with a bachelor degree or higher. A college graduate is considered underemployed if they work in a job that typically does not require a college degree. The red line shows the percent of recent college graduates, 22 to 27 years of age, that are underemployed. 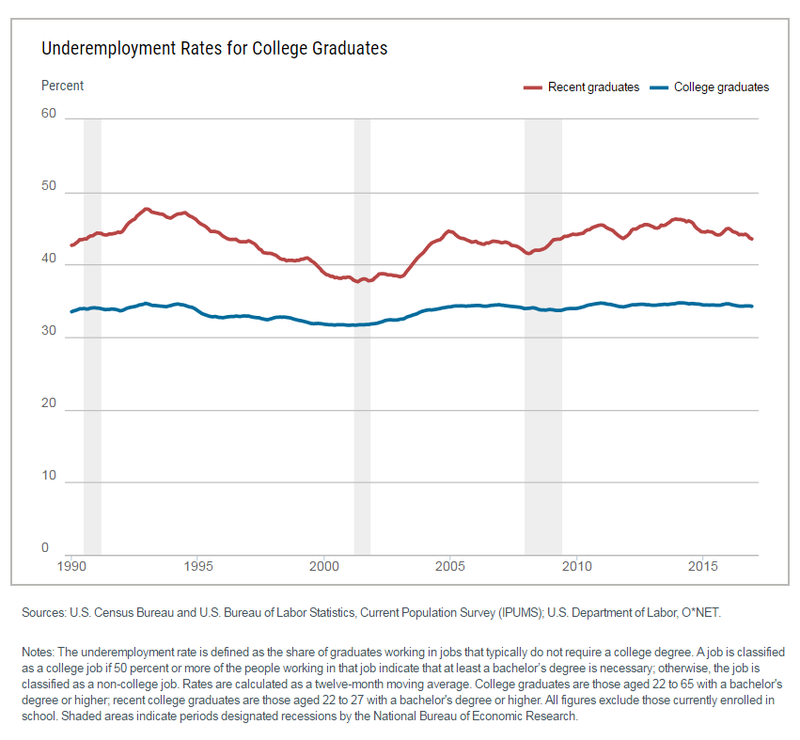 The blue line shows the percent of all college graduates, 22 to 65, that are underemployed. As we can see, approximately 44 percent of all recent college graduates with a bachelor degree or higher are currently working in what the Federal Reserve Bank of New York calls “non-college” jobs. The same is true for roughly one-third of all college graduates. While the percentage of underemployed college graduates has largely remained unchanged, the same is not true about earnings trends for college graduates employed in non-college jobs. The following chart highlights the share of college graduates in what the Federal Reserve Bank of New York calls good non-college jobs–those paying an annual salary of $45,000 or more–and low-wage jobs–those paying an annual salary of $25,000 or less. As we can see, the percentage of college graduates employed in good non-college jobs has steadily declined since 2001. For recent college graduates (dark red line), the rate fell from approximately 50 percent down to 35 percent. The percentage with low-wage jobs rose, over the same period, from roughly 10 percent to 13 percent. There are many good reasons to pursue a college education. But there is little evidence that employers are now busily creating jobs that require high skill or that a bachelor’s degree or higher is some automatic ticket to a financially rewarding job. As shown above, a significant share of college educated workers are unable to find jobs requiring a college education. And those workers are finding it ever harder to land a “good” non-college job. The problem is not with US workers—it is with the job creating strategies of most businesses operating in the US. Recessions are bad for most people: production, employment, income all fall. But economic expansions are supposed to more than compensate for the down times. However, as we see below, that is no longer the case. 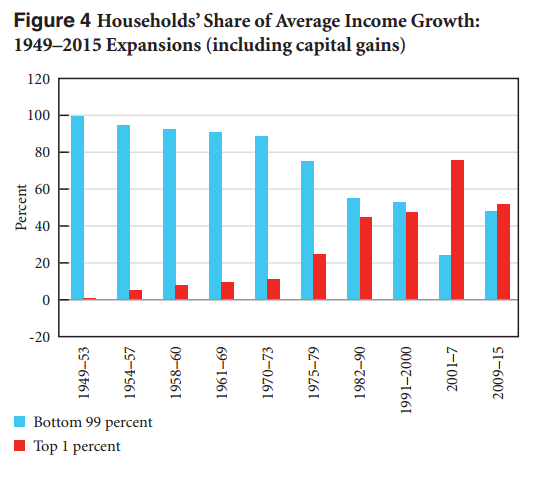 Increasingly, the lion’s share of all the new income generated during economic expansions now goes to a very few. In other words, a sizeable majority of the US population now loses regardless of the state of the economy. It is time to shift the focus of our discussions from how best to control the business cycle to how to build a movement strong enough to transform the workings of contemporary capitalism. Pavline R. Tcherneva has calculated the distribution of new income between the top 10 percent and bottom 90 percent of households and the top 1 percent and bottom 99 percent of households in every post-war US economic expansion. The following figures come from her Levy Economics Institute of Bard College policy paper titled Inequality Update: Who Gains When Income Grows? Figure 2 shows a steady rise in the share of income growth claimed by the top 10 percent of households (red bar). However, as we can see, a striking change takes place with the 1982-90 economic expansion. 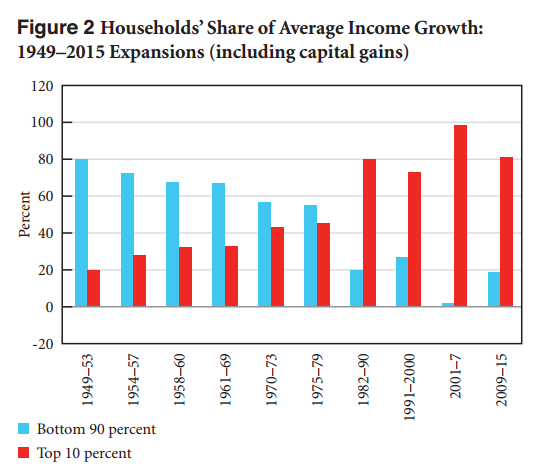 Starting with that expansion, the top 10 percent have come to dominate the income gains, leaving little for the bottom 90 percent of households (blue bar). And as Tchervena comments: “Notably, the entire 2001–7 recovery produced almost no income growth for the bottom 90 percent of households.” So much for the pre-Great Recession debt-driven golden years. Figure 4 illustrates the distribution of income gains between the top 1 percent of households and the bottom 99 percent of households. As we can see, the top 1 percent of households now capture a greater share of newly created income than the bottom 99 percent of US households. It is no exaggeration to say that our economy now largely works only for the benefit of those few families. the growth pattern that emerged in the ’80s and delivered increasing income inequality is alive and well. The rising tide no longer lifts most boats. Instead, the majority of gains go to a very small segment of the population. As I have discussed elsewhere, this growth pattern is neither accidental nor unavoidable. It is largely a by-product of policy design, specifically, the shift in macroeconomic methods used to stabilize an unstable economy and stimulate economic growth.